At that time the disciples came to Jesus and said, "Who then is the greatest in the kingdom of heaven?" It is after this lesson that Jesus' apostles ask him, "Who then is the greatest in the kingdom of heaven?" The apostles were not concerned about abstract theological or eschatological concepts. They were not concerned about who the most powerful, most important, or most influential human being in heaven was going to be. They were concerned about who, on earth among them, would be the greatest ruler of the Church. Jesus had just finished telling them twice that he was about to go to Jerusalem and be delivered into the hands of the chief priests, elders, and scribes to be killed (16:21; 17:22-23), and Matthew tells us that "they were greatly distressed" (17:23). The very next conversation between Jesus and his apostles involves this same concern, and they want to know who the greatest apostle is among Jesus' disciples. They want to know who the greatest apostle is because it would be Jesus' apostles who would rule over the people of God, the new Israel united with him in his death, resurrection, and ascension (Matt. 10:1-7; c.f. Mark 9:33-41; Luke 9:46-50; 22:24-30). At this point it's important to notice that what Jesus does next is just as valuable as what he says next. Matthew tells us that Jesus called a child to himself and set him before him. In other words, an Israelite child within earshot was called by Jesus; after that call, the child turned toward Jesus and was willing to sit before him. Then Jesus spoke, saying: "Truly I say to you" --and the you is plural in the following instruction, referring to his apostles who are in the room with him-- "unless you (plural) are turned back and come to be like children, you (plural) will not come into the kingdom of heaven; whoever then humbles himself as this child, he is the greatest in the kingdom of heaven." This was a warning from Jesus to his apostles that even they could fall from grace. This was a warning that even they might stumble (scandalizo) and fall short of entering the kingdom (and as we find out later, Judas would be one of them in the room to actually do so). If they were to rule the new Israel, they were supposed to rule the way Jesus wanted them to; and Jesus wanted them to heed his call and humble themselves like the child did. If they found themselves straying away from him, they need to turn back around and follow him. They were to do this precisely because they represented Jesus, their king, as they went about exercising authority over the Church in his name. They were not to expect the people of Israel, like the Jewish Temple-tax collector in the previous narrative, to heed Jesus' call if they were not willing to humble themselves and follow Jesus to the end, just as Jesus humbled himself and followed his Father's will to the end. If they were to be shepherds of Israel, they were to emulate their Chief Shepherd, Jesus. As noted above, this entire discourse between Jesus and his apostles is unified. Units "A" and "A'" mirror each other in their emphasis upon the kingdom of heaven (18:1, 23). Between these units we find a discussion about causing fellow Israelite brothers to stumble (scandalizo) in their walk back toward (and with) Jesus. In between these sections we learn why it was important for the apostles to not be a stumbling-block before other brethren, and also what kinds of ways they could behave if they were to confront another Jewish brethren that remained stumbling blocks (scandalizomen) before others. (Throughout the book of Acts, the enemies of the Christians are not Gentiles; they're Jews who don't accept the claims of Jesus and his apostles about his lordship. Imagine how difficult it would have been to minister to Jewish brethren caught in the tension between the faith they were raised their whole lives to believe, i.e. temple-centered Judaism, and the message of the apostles about Jesus-centered Christianity.) In the center of all five sections (seen above) we find the Father's love for His people; we find the very heart of the Father's will in sending His Son into the midst of Israel. We also find the heart of Jesus, who wants his apostles to become like "sons" of their Heavenly Father too. In the corresponding section to "A" (18:23-35, section "A'") Jesus provides a parable about a king who wanted to settle accounts with his slaves. This, of course, is a parable about the will of the Father in sending his Son into the midst of Israel to represent him, and the slaves are likened unto Jesus' apostles and their treatment of the people within the King's realm. The "King" visits his people, and the "Lord" goes to collect debt appropriately. After pronouncing judgment against him, the slave begs his Lord for mercy and promises to pay what he owes. Because the slave pleads with him and promises to pay off his debt, the Lord then has compassion upon him, releases him from the pronounced judgment, and forgives him. Mentioning these things is not accidental. It is intentionally illustrative of how Jesus approached his apostles. He came to them. He pronounced judgment upon them, saying "Repent! For the kingdom of heaven is at hand!" They believed, repented, and followed him; and he showed compassion upon them, absolved them, and forgave them. This was to be the way they ruled the new Israel. This was to be their reminder in their time of trial, when they found fellow Israelites causing others to stumble and fall on their way into the kingdom, on their walk with Jesus, after hearing his call. They were to forgive their "offensive" Israelite brothers in the same way. They could pronounce judgment justly even as their Lord did, but if their brethren were to plead with them, they were to forgive. Even if their brother was to sin against them seventy times, they were to forgive that many times. The reason for this overflowing, abundant amount of forgiveness was, of course, because the people of Israel were living in a terminal generation. God's judgment upon them was at hand (Matt 3:7-12). 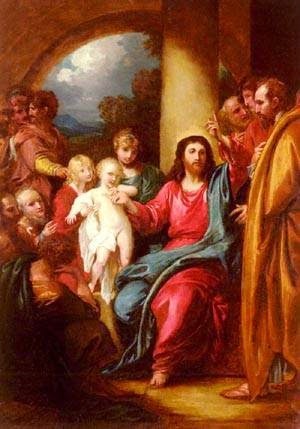 They were the ones who received "little ones" into the fold of God to receive Christ, and in the receiving of them they were supposed to forgive from the heart too, not just superficially, because that too is what would show the heart of their Father in heaven: that every one of His sheep is worth saving. These instructions were originally to Jesus' apostles, but they apply to all other apostles of Christ's Church as well. When God calls people to Himself, and then commissions some of them to represent Him and rule over His sheep, that exercise of authority is supposed to be accompanied with humility; and not just any definition of humility will do. Humility, in this case, must be defined by the illustration laid out by Jesus. They must come to be like children before Jesus. They must not be be a stumbling-block among other brothers and they must confront their brothers when they are causing others to stumble too. Even when sinned against, they must show great mercy, absolve those who repent, and forgive as many times as their brothers seek forgiveness. They are the ones who are called by Christ to bind and loosen on earth, and so they are the ones who must hold the keys to Christ's kingdom faithfully. Matthew 18 is not a set of "laws" on how to deal with all kinds of conflict among all kinds of Christians. It was never supposed to be viewed that way. It was never supposed to illustrate what absolutely must be done procedurally in order for all perceived "offenses" among all Christian brethren to be resolved. Such over-arching generalizations are preposterous. In its original historical context, chapter 18 was a set of instructions for apostles regarding the way they handled Jewish opposition to Christ's message and Jewish converts who were stumbling (or causing others to stumble) in their faith. By extension, the "procedures" of Matthew 18 only apply to directly to Jesus' apostles and their apostles, but certainly not everybody in the Church. As a private discussion between Jesus and his apostles, those instructions pertained to their responsibility as judges of Christ's Church (which is why there is a repeated reference to "two or three witnesses" and another mention of "binding and loosening" exactly like Jesus' commission to Peter in 16:19; c.f. 18:18). Matthew 18 was a set of examples and warnings to the appointed rulers of Christ's Church, examples and warnings about misusing and abusing the keys He gave them. And the first keys He gave them were compassion, absolution, and forgiveness. The officers of Christ's Church would do well in using them first still, instead of shirking responsibility or throwing down the gauntlet on laymen and laywomen. 1. A stater is a silver coin worth four drachmas.